T he Joliet Jackhammers played on the silver cross field. The stadium is located in Joliet, Illinois and was built in 2002 for the Jackhammers. It is a relatively small stadium built in two levels and it can fit no more than just over 6000 spectators divided in 20 rows of seats. There is also an area that has general admission where people can bring blankets and sit on the lawn. There is, as you would expect , plenty of free parking around the stadium considering that it is located in downtown Joliet. You can also get to the stadium using several buss and metro lines. In 2010 the Jackhammers lost the stadium due to non-payment of outstanding debts and the stadium has since then belonged to Steel City Baseball. 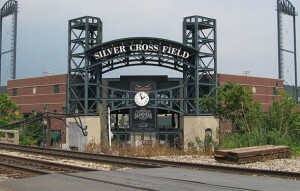 The stadium is named silver Cross after the silver cross hospitals that owns the name rights to the stadium.